1. Commitment – there must be a serious commitment to a regular schedule of visitation. We will expect a minimum of 4 visits within 6 months, unless the volunteer informs TDS of any expected absence, stating reasons. 2. Emotional preparedness – be emotionally prepared and have a cheerful, outgoing and friendly nature to interact with the elderly, children and adults with disabilities. 3. Listening Ear – be able to lend a listening ear without being critical or judgmental, and be able to show empathy. 4. Creating positive effects – learn to recognize and maximize situations to create positive effects for the receiver e.g. for bedridden patients, carry a small dog into his arms for patting or command a big dog to “feet up” onto bed for patting. 5. Controlling dog – be in full control of the dog in its interactions with other dogs and humans (patients/residents). 6. Punctuality – be punctual for each visit, preferably arrive 10 minutes before 3 pm to allow the dog to settle down and get ready for PAT work. As the PAT programme will require visits to various health institutions, special schools and nursing homes, all dogs should be of sound health and free from any illnesses. – All dogs must be at least 2 years of age to volunteer and those between 1-2 years old would need to have obedience training. As all dogs will be interacting with patients/residents, it is of the utmost important that the dogs are obedience-trained to a certain degree. – All dogs have to be basic obedience trained, preferably GCC (Good Canine Citizen) or higher. – A separate evaluation test will be carried out if the dog is not GCC-certified. – Category B dogs – please contact TDS for special information. 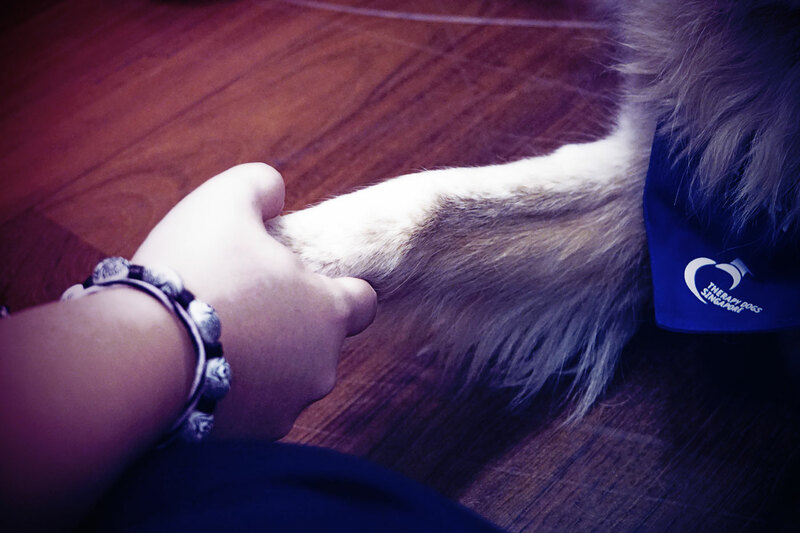 All therapy dogs have to show sound temperament as they will be handled by both adults and children who may have little or no experience in handling animals. – All dogs have to be temperamentally friendly and have the aptitude to be therapy dogs. – They have to be able to accept being patted by more than 1 person at any time. – They have to be of a more tolerant nature. – They need to be calm at all times during visits, even when there is loud noise, such as shouting or slamming of doors, movement of wheelchairs or trolleys. Please note that each & every dog owner will be fully responsible for his charge(s) and TDS will not be held responsible or liable in the event of any unforeseen circumstances. Fill in the form (click on the button) to tell us more about yourself and your dog(s). The application form is best filled using a PC, and is not convenient for mobile users.